I just finished watching Pride and Prejudice, and all I can say is could there have been a more pointless remake? There was nothing new gained from watching it at all, in fact I thought it was considerably lacking in a lot of things that the BBC adaptation had. It didn't have any charm, or passion between Elizabeth and Mr. Darcy. And what's worse, they turned Mr. Collins from a hugely comedic character into a pitiable little man, which he was before - but why remove the humour? What's with Keira Knightley anyway? Why is she everywhere now? I think I'll go watch the BBC version of Pride and Prejudice once more... ooh, or read the book again. Every time I read it, I ended up talking funny for days, it's the language, I love it. Anyway. I saw this version, and thought it was ok. Of course I hace not read the book or seen any other versions of the movie, so I guess my opinion doesn't really count..
Sure it does. But I definately recommend the book, it's fabulous! 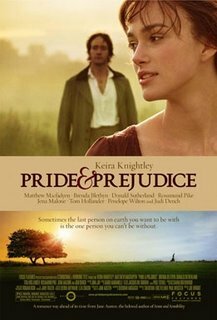 Did you notice that the film even used the same dance as the BBC adaptation, for that critical dance at Netherfield between Lizzy and Mr. Darcy. I thought that was shocking. The only thing I preferred about the film was Mary, she was portrayed much more sensitively.